The following technical terms and their definitions are essential for understanding Nitinol and the concepts presented in this document. For an extensive list of standard terminology it is recommended to reference ASTM F2005 – Standard Terminology for Nickel-Titanium Shape Memory Alloys. Active austenite finish temperature (Active Af) – term for austenite finish temperature of raw wire, tube, sheet or semi-finished component as determined by bend and free recovery (BFR) test method described in ASTM F2082. The active Af is often preferred when specifying thermal properties of a component as it is more representative of performance in application. Austenite – the high temperature parent phase of the Nitinol alloy having a B2 crystal structure. Austenite finish temperature (Af) – the temperature at which martensite (or R-phase) to austenite transformation is completed on heating of the alloy. Austenite peak temperature (Ap) – the temperature of the endothermic peak position on the differential scanning calorimetry (DSC) curve upon heating for the martensite (or R-phase) to austenite transformation. Austenite start temperature (As) – the temperature at which the martensite (or R-phase) to austenite transformation begins on heating of the alloy. Free recovery – unconstrained motion of a shape memory alloy upon heating and transformation to austenite after deformation in a lower temperature phase. Lower plateau strength/stress (LPS) – the stress measured at 2.5 % strain during tensile unloading of the sample, after loading to 6 % strain per the method described in ASTM F2516. Martensite – the lowest temperature phase in Nitinol shape memory alloys with a B19’ (B19 prime) monoclinic crystal structure. Martensite deformation temperature (Md) – the highest temperature at which martensite will form from the austenite phase in response to an applied stress. At temperature above Md the Nitinol shape memory alloy will not exhibit superelasticity it will rather exhibit a typical elastic-plastic behavior when loaded. Martensite finish temperature (Mf) – the temperature at which the transformation of martensite from austenite (or R-phase) is completed on cooling of the alloy. Martensite peak temperature (Mp) – the temperature of the exothermic peak position on the DSC curve upon cooling for the austenite (or R-phase) to martensite transformation. Martensite start temperature (Ms) – the temperature at which the transformation from austenite (or R-phase) to martensite begins on cooling of the alloy. Pseudoelasticity – another name for superelasticity. See superelasticity. R-phase – the intermediate phase which may form between austenite and martensite. The R-phase occurs in Nitinol alloys under certain conditions. The R-phase has a rhombohedral crystal structure. R-phase finish temperature (Rf) – the temperature at which the transformation from austenite to R-phase is completed on cooling; in an alloy that exhibits two-stage transformation. R-phase peak temperature (Rp) – the temperature of the exothermic peak position on the DSC curve upon cooling for the austenite to R-phase transformation. R-phase start temperature (Rs) – the temperature at which the transformation from austenite to R-phase begins on cooling; in an alloy that exhibits two-stage transformation. R’-phase finish temperature (R’f) – the temperature at which the martensite to R-phase transformation is completed on heating of an alloy that exhibits two-stage transformation. R’-phase peak temperature (R’p) – the temperature of the endothermic peak position on the DSC curve upon heating for the martensite to R-phase transformation. R’-phase start temperature (R’s) – the temperature at which the transformation from martensite to R-phase transformation begins on heating of an alloy that exhibits two-stage transformation. Residual elongation (Elr) – the percent strain measured after tensile loading to 6 % strain and unloading to 7 MPa per ASTM 2516. Superelasticity – nonlinear recoverable deformation behavior of Nitinol shape memory alloys that occurs at temperatures above Af but below Md. Uniform elongation (Elu) – the percent elongation (or strain) determined at the maximum force sustained by the test sample prior to necking, or fracture, or both upon tensile loading per ASTM 2516. Upper plateau strength/stress (UPS) – the stress measured at 3 % strain during tensile loading of the sample per the method described in ASTM F2516. Over the years, as a leader in Nitinol manufacturing, our team at Memry has accumulated a vast amount of metallurgical and component processing knowledge. As a company, Memry is dedicated to making your job easier by disseminating our knowledge in Nitinol through the publication of technical content. Nitinol is a trade name taken from the elements it’s composed of—nickel (Ni) and titanium (Ti)—and the scientific group that discovered it—the Naval Ordnance Laboratory (NOL). A team from the NOL discovered the alloy while searching for materials that could be used in tools for dismantling magnetic mines. In an article published by Time in 1968, discoverer William Buehler discussed how he thought Nitinol might be used to prefabricate tools used in deep water or space. At the time, Goodyear Aerospace Corp. had envisioned deforming a Nitinol satellite antenna and placing it into a small rocket payload, then restoring it to its original shape upon deployment by using heat. Beyond these early predictions, Nitinol has proved to be widely useful in the medical device arena. Engineers have used it for devices that maintain blood flow within an artery, implants that restore function to a failing heart valve and retrieval devices that remove life threatening blood clots from deep within the brain. You can learn more about Nitinol from our Memry white papers. 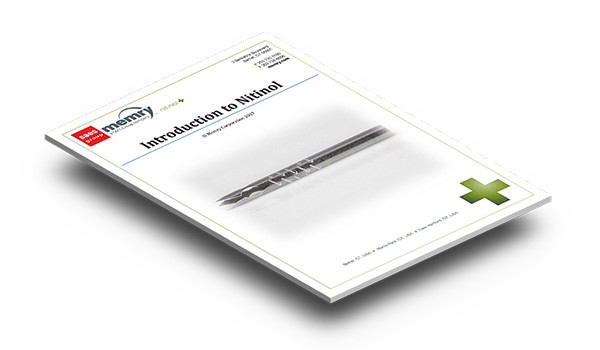 A comprehensive guide to Nitinol is available for download here. This document provides the information required for a solid technical understanding of concepts ranging from metallurgy and the effects on physical properties to ideal component manufacturing technologies and common quality control testing methods.